All New Hope homes currently listed for sale in New Hope as of 04/21/2019 are shown below. You can change the search criteria at any time by pressing the 'Change Search' button below. "Elm Grove Estate is one of Bucks County's most legendary properties, having been a center of wealth and hunt-country heritage for hundreds of years. 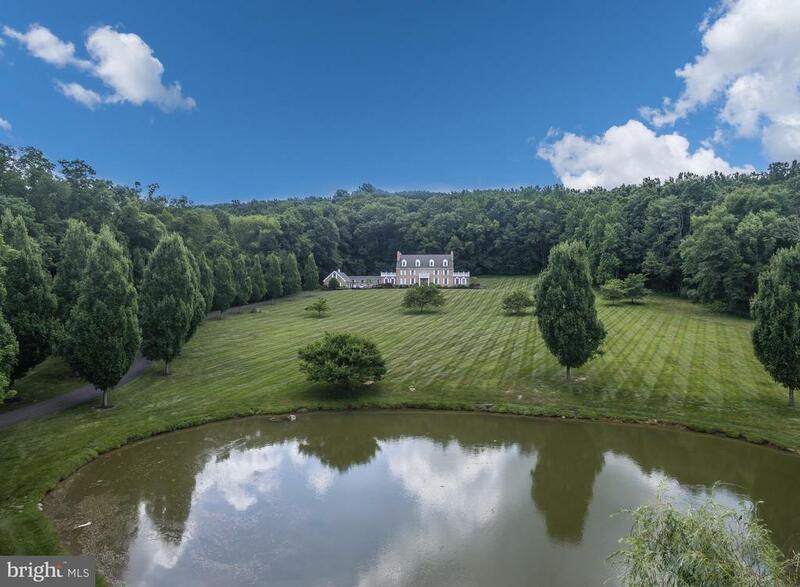 Offered outside the Paxson family for only the second time since 1680, this 75+ acre estate was part of the Colonial province of Pennsylvania. The property began with a stone settler's cottage and grew to include a c. 1700 stone manor house with later additions, a carriage house, barns, workshops and extensive stables used by the former owner for her champion thoroughbred-breeding facilities until 2000. Well hidden behind a long, ivy-covered stone wall, the main house, outbuildings and the surrounding preserved countryside feel like an English estate. This Estate underwent extensive restoration and updates during the past 15 years, preserving its architectural details and manor-house proportions while also serving as a comfortable family residence with modern amenities. Built in three sections dating to 1700, 1739 and 1938, the main house is approximately 8,601 square feet. Outside, the stone has been carefully repointed. Inside, every piece of millwork and moldings, the pocket doors, locks and hardware and the plaster walls are as fresh as they were in the 18th century. There are 10 fireplaces, high ceilings and a bounty of tall sash windows for great natural light. Its wide main entry hall is flanked by an intimate, formal reception room; the hunt room with walk-in fireplace and superb views; and an expansive formal living room that accommodates multiple seating areas and accesses a large rear patio. Throughout its history, this home has hosted grand-scale events. An addition completed in 1938 contains an exquisite formal, mansion-sized dining room with a hand-painted ceiling and tall Jefferson windows with stunning views. Serving this area is a butler's pantry and a true commercial-grade kitchen. Above are 2 floors of private quarters along with a library. There are 10 bedrooms, including 2 main suites, and 7 full ba"
"This magnificent estate property on 50 secluded, preserved acres offers an exquisitely finished custom home, restored stone 4 BR 3 Bath Guest House, & totally restored 1739 farmhouse, now a 2-story, 2+car garage/equipment barn. In addition, the property is a great mecca for entertaining with a heated salt water pool & spa w/ outdoor pergola, outdoor terraces, tennis court, 13 ft. deep stocked pond w/gazebo, fruit tree orchards, 16 Ac. of open fields, 34 Ac. of woods, prof. landscaping, shade trees and perennial gardens. The beautifully proportioned architect-designed home by Richard Zaveta, is built of hand cut stone,w/a slate roof,& copper gutters and downspouts. The beautifully decorated home is finished with the finest of materials- quarter sawn oak flooring, marble, limestone, designer carpeting, arched doorways, European solid wood doors, 6 fireplaces, 10 ft. ceilings on the first floor, top-end d~cor, imported chandeliers, and offers a 3-story elevator, 10 seat home theater, 1000 bottle climate controlled wine cellar and tasting room,& full bar. The cook's kitchen is equipped with a commercial grade 6-Burner Viking Range w/griddle & two ovens, granite counters,2 dishwashers, Subzero Refrigerator/Freezer with drawers, warming oven, and sunny breakfast room. to an outdoor terrace. A china room is a great pantry/storage space adjacent to the gorgeous Kitchen, which is adjacent to a comfortable Great Room with stone fireplace & French Doors to an outdoor terrace. A cherry paneled library, step-down conservatory w/casement window surround, & a covered porch w/outside fireplace and cove lighting enhance the living space. All rooms are of grand scale and beautifully appointed. The Main BR suite has a balcony, and is equipped with a coffee bar; the suite includes a marble bath with shower for two, jetted tub, and a dressing area with two large walk-in closets with closet systems. Every luxurious bedroom is en-suite and has a walk-in closet and beautifully appointed"
"Riverstone Lodge - an iconic stone Riverfront home located in a highly desirable and prestigious area of New Hope Borough. The spectacular sprawling 6600+ sq ft home offers 6 bedrooms and 5 full baths. There is a first floor bedroom with full bath ideal for in-laws, au pair or a guest room. The sumptuous Master Bedroom and bath with sitting room and 2 gas fireplaces have amazing views of the Delaware river. Riverstone Lodge takes advantage of Pennsylvania stone both on the exterior and interior. Although the exterior depicts the proverbial Bucks County farm house the interior, with its open and continuous flow, has the sensibility of a mid century modern home. The expansive and open Kitchen and Breakfast area display high grade material and appliances. A blue tile accent wall with fireplace become the nucleus of the room. The adjoining Living room with wet bar flows into the Dining room and then large Family room with stone wall and woodburning fireplace. No matter where you look the views of the river are stellar and become the focal point of this home. The property provides one of the longest riverfronts in town. The unusually large outdoor entertainment space comprised of a deck and blue stone patios can accommodate the largest of parties or family gatherings. The stone walls cascade down to the river offering private access and lounging. Meticulously maintained, public water and sewer and less than a mile from one of the premier and highest achieving pre_K through 12 public schools in Pennsylvania. Riverstone Lodge is one of the most sophisticated and stunning properties in all of Bucks County. It is truly a home that can provide decades of family enjoyment and a lifetime of memories." "Spectacular new home site at the foot of Jericho Mountain in Upper Makefield Township. 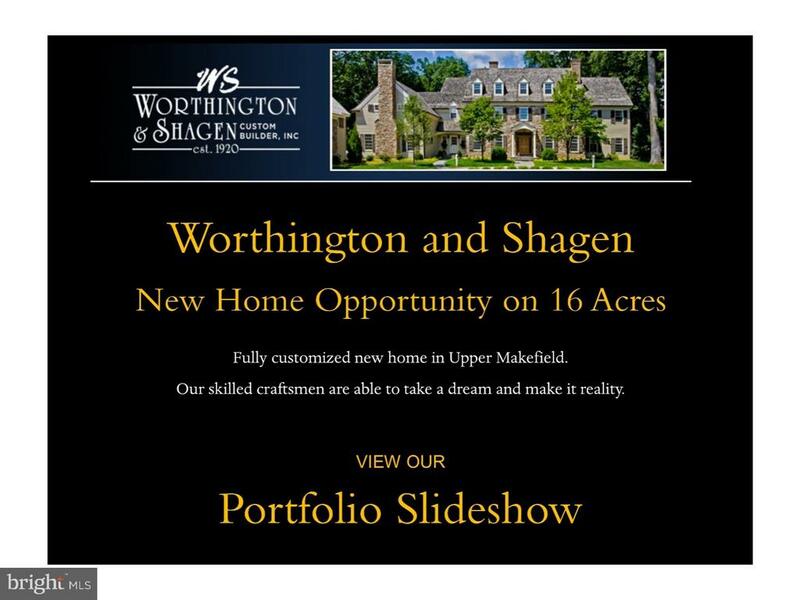 Worthington and Shagen, Custom Builders who crafted Merrick Farm, are pleased to present an opportunity to build an estate quality traditional Bucks County Manor Home. This magnificent lot that features, woodland, meadow and stream. 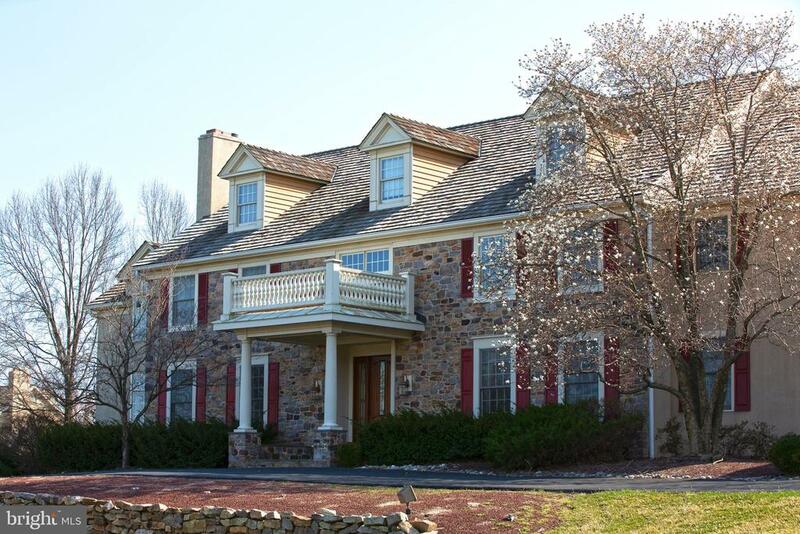 High quality natural finishes and extensive features are designed into this quintessential Bucks County masterpiece. Customization is invited as well." "Waterview Place, New Hope's most prestigious address overlooking the Delaware River. This 2-story, 7,500 square foot penthouse offers an elegantly designed home with truly spectacular water views. From the moment the keyed elevator opens to your own private foyer, one is immediately drawn to the wall of floor to ceiling windows showcasing magnificent views of the Delaware River. The water view theme continues throughout the home with most rooms and all the terraces providing this amazing river view. The home features an open floor plan which includes a large window filled living room with fireplace and terrace, a formal dining room and a gourmet kitchen with breakfast bar and a breakfast room with a fireplace and yet another river view terrace. The first-floor master with its corner location and wall of windows and terrace provides a beautiful and serene retreat. The master suite also includes a private sitting area/TV room, huge spa quality master bath and walk in closet with center island. Also, on the first floor is a beautiful, very sophisticated wood paneled library/ bar room. The second level features a state of the arts in- home theatre with 3 screens, surround sound and very comfortable seating. When not watching a movie, one can gaze out of the huge Palladium window onto the river. This level offers a flexible floor plan with an additional 3-4 rooms allowing for additional bedrooms, gym, office or bonus room. It also includes 3 full baths. 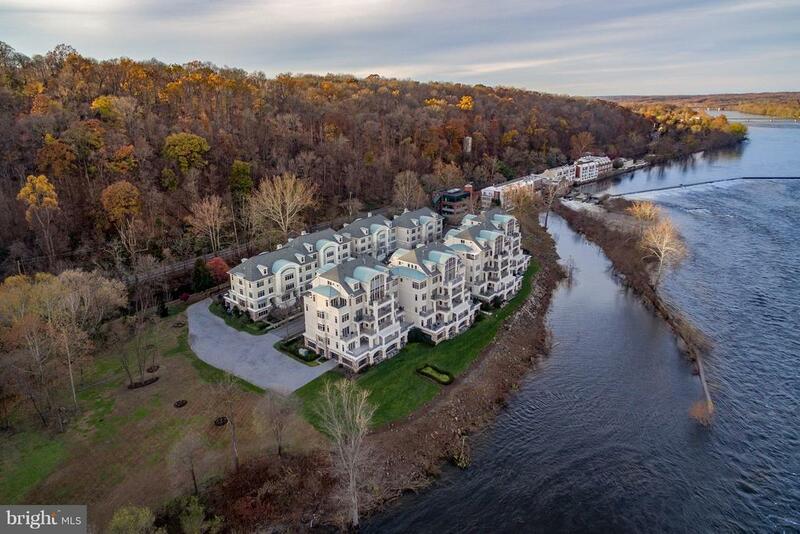 This penthouse is one of the largest offered at Waterview Place which was the first truly luxury condo community tucked away between the Delaware River and the Delaware Canal in New Hope, Bucks County. 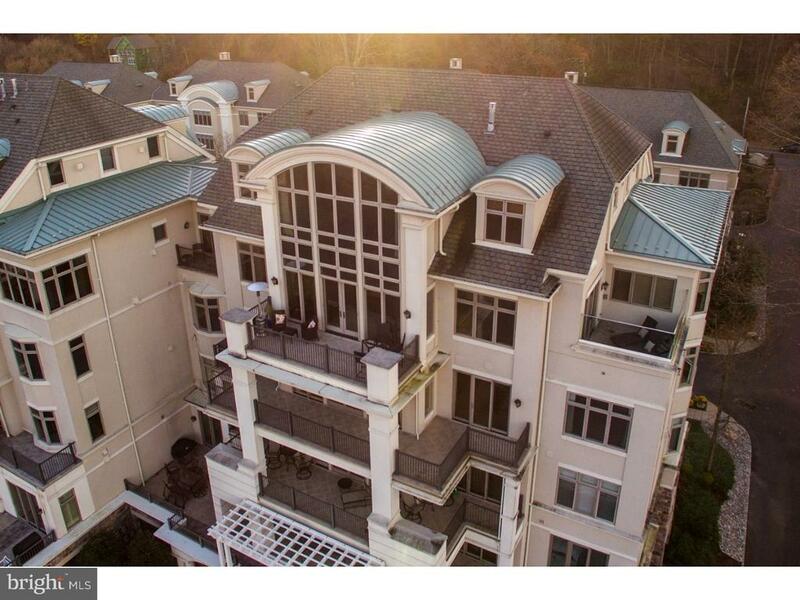 It has maintained its sophistication and remains a choice location for those seeking a beautiful waterfront residence in a boutique sized community. Perfectly located 30 minutes to Princeton, 50 minutes to Philadelphia and 70 minutes to NYC." "On 36.68 acres, Long Willow Farm is a world unto itself where Bucks County tradition meets fresh, custom construction, all in a private, rolling setting with a 5BR main residence, converted 3BR barn residence, updated 1BR guest house, saltwater pool, pond, open field & mature woodlands. Set back a long driveway, the c. 1788 stone house with several additions was most recently expanded & updated in 2009 to become a 6,200SF residence. In 2013, the property's bank barn was enlarged & converted into stunning living space complete with elevator & top-grade custom finishes. The renovation & expansion was overseen by architect Lynn Taylor with construction by Eric Greb. Once a working farm & later home to notable writer & playwright John Hess, the property still bears evidence of its agricultural past with its outbuildings, pond & hay fields. Long Willow Farm mixes updated-yet-character-filled historical spaces showcasing fireplaces, built-ins, deep windowsills & freshly refinished wood floors with airy, newer rooms designed for today's needs, with pristine hardwood floors, pocket doors, custom millwork & moldings, radiant heat in many areas & exceptional natural light. Spacious formal dining room; cook's kitchen with island, walk-in pantry & soapstone countertops; family room with sliding doors to a slate veranda overlooking the saltwater pool; dramatic 2-story library with fireplace features a custom stairwell to a loft lined in custom cabinetry; tavern room with wet bar & fireplace. The 1st floor also contains a an in-law/au pair suite with balcony & a bonus room finished with a Mercer tile floor & wainscoting. The main suite features a gas fireplace, updated bath & walk-in closet, 4 addt'l BRs & 2 baths. For outdoor enjoyment, choose from multiple patios, easy-care perennial gardens, the pool area & the pond, also excellent for fishing. The converted bank barn offers additional, beautifully finished living quarters perfectly suited to any generation as it has an elevat"
"This is a Sample Home. Construct this home on your lot or ours for $2.9 million. This home is one of the finest craftsman style Greene and Greene residences ever built. Every detail of your new home is carefully designed and constructed from the floor plan and every interior detail to each and every elevation which incorporates the finest materials and architectural details. Hand split red cedar roofing, custom cut and finished siding, copper built on site gutters and the finest casement windows you have ever seen are but a few of the exceptional elements incorporated into this home. The Kitchen is another example of what makes this home elegant and very comfortable. Master Suite includes separate His and Her baths. The floor plan is open and comfortable for everyday living and formal entertaining. Clinker brick and river rock chimneys, walls and walks grace the property and add an additional dimension bringing the outside into the living areas. POLO Design Build will work with your clients to design a home that incorporates every element that your client wishes to include in the scope of the project. Beginning with Interior Design as the foundation of the project, POLO will measure and take a photographic record of every piece of furniture and artwork and develop a plan where the placement of every piece of furniture and artwork are incorporated. This is a primary fundamental design service which drives the homes lighting plan and the flow of the home. There is only one way to furnish a room the right way. This is determined by the function of the room, the size, the ceiling height, the glazing area, the traffic area etcetera. The best way to described a perfectly designed home is one in which you feel absolutely comfortable in every room even if it isn't the style that you prefer. This design approach is expanded to include architectural design, landscape architectural design and construction. 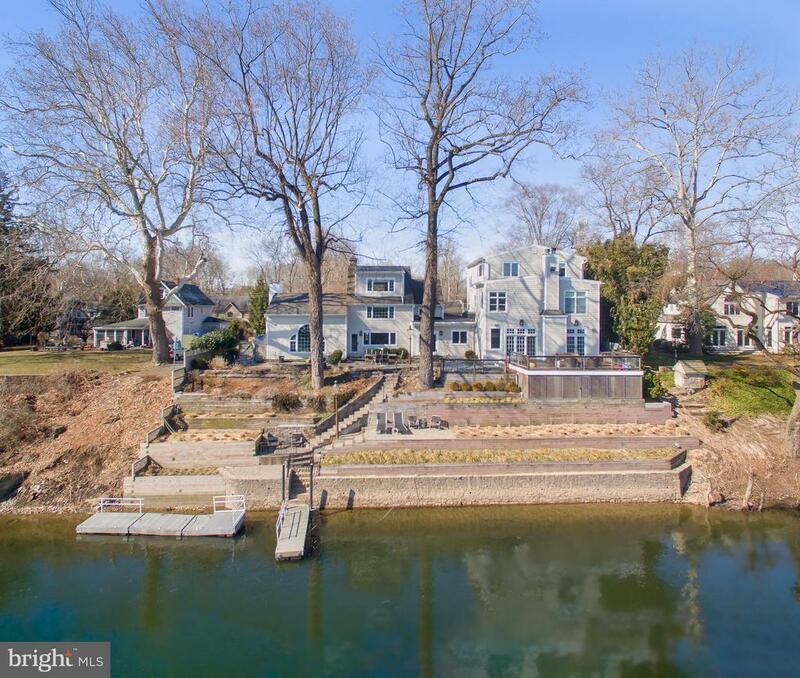 Eve"
"Enjoy Bucks County with Gorgeous River Views! This custom estate has been EXPANDED and offers an amazing location on nearly 5 acres on a quaint cul de sac sitting above the river. Bright, open layout with versatile space this home is sure to impress. Gleaming finished in place hardwood floors throughout. Sleek, NEW Designer Kitchen featuring Wolf & Subzero appliances, oversized island with seating, lots of prep space and storage and open to the breakfast room with walls of windows overlooking the river. Enjoy the seasons or read a book under the screened in porch. 1st floor Main Suite with vaulted ceilings, French doors out to a private terrace and marble bath. 2 story Library offers an amazing space with custom built-ins. The upstairs offers even more functionality highlighting a living area with balcony overlooking the river, 4 Bedroom Suites and a homework nook. The lower level offers additional living space, custom bar, climate controlled wine room, media room and a half bath. So many lovely features including 10' ceilings, multiple fireplaces, 3 car garage, custom millwork, plenty of wall space for art collectors and fantastic location convenient to I-95/295, Princeton & NYC." "Architect-designed and newly expanded in 1997, this secluded, light-filled 5 Bedroom, 5.1 Bath home enjoys magnificent views, the sounds of nature, and is a mecca for total enjoyment! 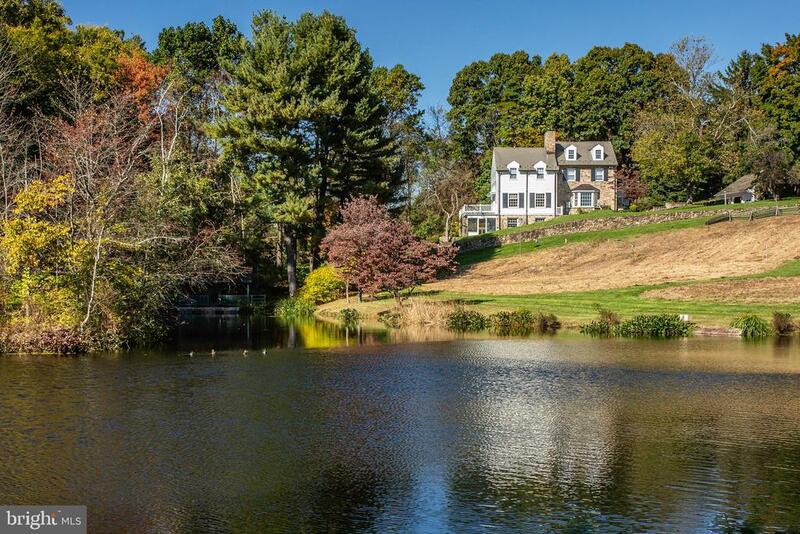 Exterior Bucks County charm has been joined with today's amenities in the best of ways!The hallmark of the property is a large 1.7 acre pond, with floating dock, log boat house w/fireplace, salt-water pool, spring house, bog pond, stone walls and sweeping lawn w/meadow grasses and flowers. Some stone walls, pine board floors, and a commanding walk-in fireplace remain from the original earlier structure, but the home was built in the best of ways just over 20 years ago. This stately stone and frame home offers a flexible floor plan, finished on four levels, allowing for numerous indoor/outdoor entertaining areas. The home, freshly painted t/o with quiet color tones, has lovely mill work, pine board and wood flooring, tall ceiling height, 3 fireplaces incl. an original stone walk-in fireplace, and windows and doors galore allowing natural light and views in every direction. From the entrance foyer w/tumbled marble flooring, the home opens to a living room w/fireplace and bay window overlooking the pond, an open dining room, & a grand great room with fireplace, French doors to an upper blue stone patio and deck, an ideal place for everyday or social gatherings. The inviting updated kitchen/breakfast room is outfitted with Viking, Wolf, & Subzero appliances, incl. a gas cook-top, warming drawer, wine cooler, three pantry closets, and access to the outdoors. A powder room is nearby. On the 2nd and 3rd floors, there are 5 Bedrooms, 4 updated baths (one en-suite, one a Jack & Jill) including a 3rd floor en suite BR, also a great place for a home office if desired. The Main Bedroom Suite (2nd floor) is a spacious respite, with an updated en-suite bath, numerous closets & window seats w/storage. The full bath is outfitted w/2 pedestal sinks, a jetted tub, & tumbled marble over-sized shower"
"Set among some of New Hope-Solebury's most valued estates. This one of a kind stone manor home boasts over 10,000 sq. ft. of luxurious living space. The home and its over 3 acres of grounds have been meticulously maintained. Beautiful landscaping, blue stone patios, fountains, boxwoods, and a private pool complex encircle the stylish home. Upon entering the home one is taken by the quality, design and wonderful flow allowing privacy as well as entertaining on a world class level. With features too many to name, this property checks off all the boxes one expects in a modern, upscale home. A number of flexible features will allow the new owners options in staging and personalizing their new home. Located perfectly 70 minutes to NYC, 60 minutes to Philadelphia and 35 minutes to Princeton. This property is available turn key. Prices for furniture, art and other furnishings are available upon request." 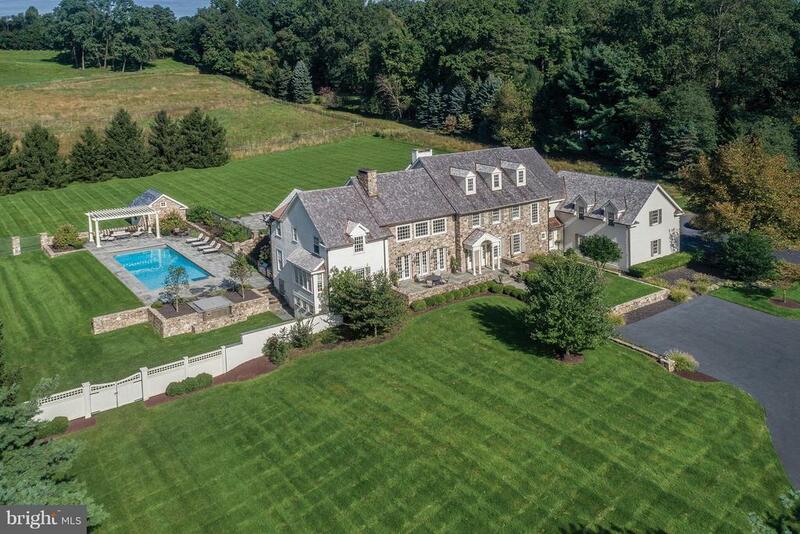 "The perfect Bucks County estate location ? five minutes from the Delaware River and Canal, the Phillips Mill Historic District, the energy of Lambertville-New Hope, and major commuter roads to New York and Philadelphia. Holmquist Farm, named for Karline Holmquist and her family, founders in the early 1900s of the progressive Holmquist School for Girls, nestles into an exclusive horse farm neighborhood, home to billionaires, theater producers, TV personalities, antique dealers, and real-estate executives. Sitting proudly on a hilltop, set in a pear orchard on 12+ acres in Solebury, and overlooking the property's verdant hayfield, the European-style stone and stucco farmhouse has a commanding south-facing view of rolling hills, cornfields, and New Hope's spectacular summer fireworks. Five bedrooms, five bathrooms, 4500+ SF on three levels, with a lower level featuring its own walk-out entrance. The house has been completely renovated and modernized by its owner, a published NY interior designer. Holmquist Farm features charming details such as warm fieldstone and stucco exterior walls, pegged oak floors, and living room ceiling beams/paneling with an oversized wood-burning fireplace. Updated features include three-zone propane heating/cooling system, climate-controlled 600+ bottle wine cellar, home cinema with stadium seating, open-plan epicurean kitchen with all new appliances, double-volume great room with gas fireplace and 19th-century French marble surround, and two master suites (on the first and second floor). Other notable features include the great room TV concealed behind a soaring gold-framed mirror, Rosso Levanto marble slab range backsplash, master spa with heated floor, and a 40' x 20' heated salt water swimming pool with sun shelf, vanishing edges, and nearby secluded outdoor shower. The low-maintenance grounds are extensively landscaped with new driveways and lighting features. Leading off the great room is a quarter-acre enclosed lawn and bluestone pat"
"Offered for the first time, this duplex penthouse at Waterview Place showcases rich finishes and commanding Delaware River views. A secure elevator delivers you to 7400+ square feet of sumptuous interiors where color, texture and fine materials play starring roles along with the views. From its exquisite custom staircase to the dramatic great room with barrel-vaulted ceiling to the three terraces offering fabulous high-floor views up and down the river, this residence is a luxe experience. The main living and dining areas are separated by architectural pillars, so they are open to each other with two sets of French doors in the living room leading to a terrace. Herringbone-pattern wood floors run throughout these rooms, and a living room fireplace, one of six throughout the apartment, stands ready for winter evenings. This room includes a wall of furniture-finish built-ins. The kitchen area is comfortably finished with a sitting area, fireplace and fabulous views. Dacor, Wolf, Sub-Zero and other top-grade appliances, an island, walk-in pantry powder room and access to a terrace complete the kitchen. Double doors lead to a media/family room. The first-floor main suite with a fireplace, sitting area and private terrace is a true retreat. The dressing room has a coffee bar, laundry room, walk-in closet and expansive bath with fireplace. Upstairs is a guest suite with full bath and a fireplace, plus two additional bedrooms and full baths and a bonus room/fifth bedroom. In addition, this unit has its own generator that runs everything you need. Two garage parking spaces are included with the penthouse. 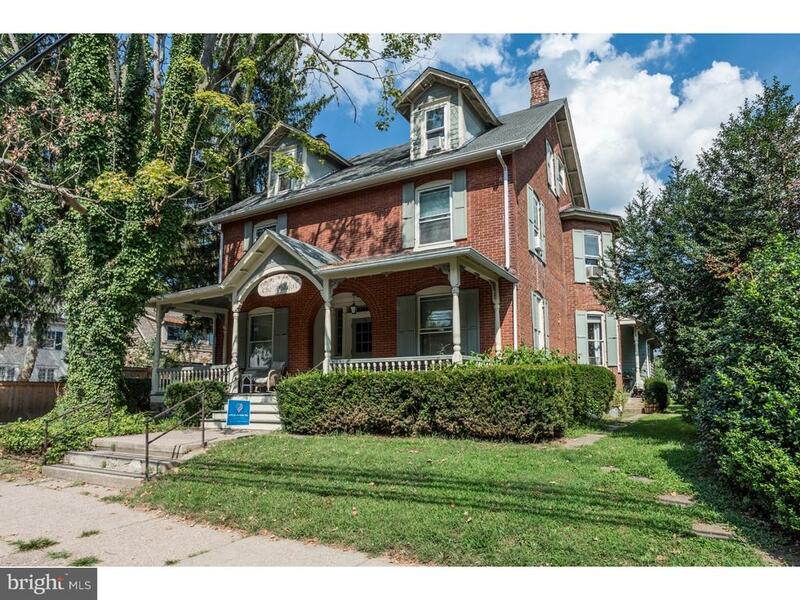 Convenient to Princeton and the Route 202 corridor and I-95 for Philadelphia." "Tower View Manor is arguably one of the more impressive examples of new construction where a budget was not an obstacle. 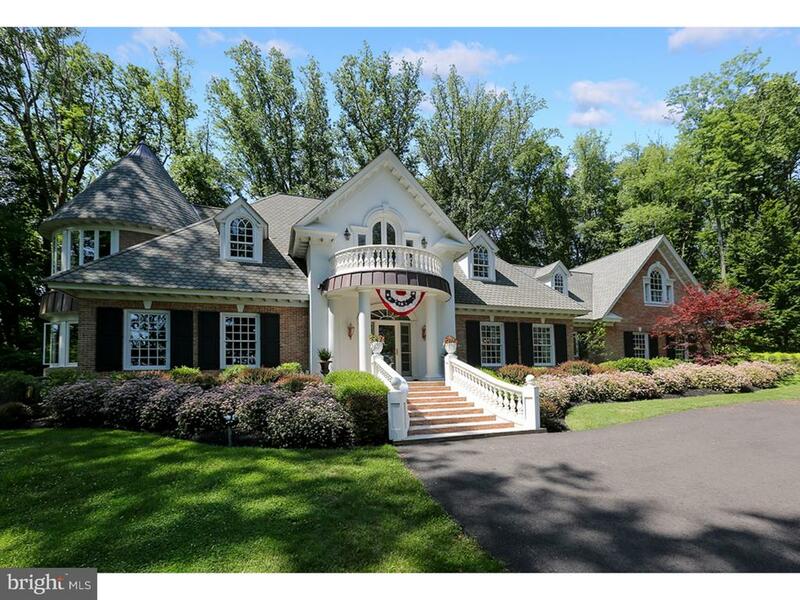 This 12,000 square foot stone manor home offers 4 bedrooms and six full baths and two powder rooms. 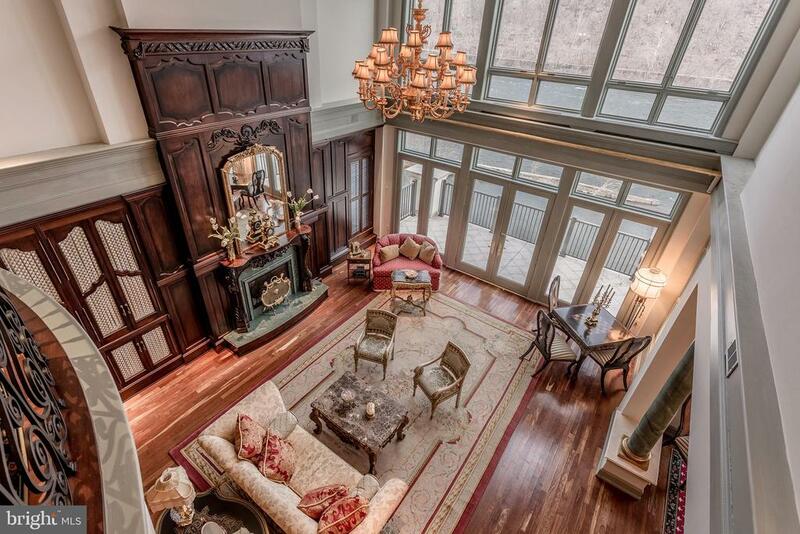 The entrance foyer leads into an amazingly grand Great Room with fireplace. Adjacent to the right of the foyer, is a European influenced dining room and a formal, cherry paneled living room to the left. An additional cherry wood library with Artisan millwork neighbors the dining room. The new kitchen offers state-of-the art appliances, cherry cabinetry and a massive granite counter space. The house is enclosed in rows of French doors that create an easy flow from the interior to the al fresco kitchen, in-ground pool, pool house and tennis court. The 4 plus acres allows for plenty of room for family gatherings or large scale entertaining. All of the rooms are expansive in dimensions and the master suite offers an oversized bed chamber, large office/study, opulent bath and a private beauty salon. One of the more remarkable aspects of this phenomenal home is the interior sports court/batting cage and adjacent changing room. The lower level is a fantasy for the holidays and fun for current or future children. A large exercise room, wet bar/kitchenette and game room...are just three of the many amenities of this dynamic space. The home is literally and figuratively crowned with a home theater on the third floor. Tower View Manor is a home that could not be reproduced today at the current asking price and is less than 10 minutes from the galleries, fine dining and the Bucks County Playhouse in nearby vibrant New Hope." "Hyperion Hall is sophisticated Country estate sited on one of the most breathtaking parcels of land in the Solebury area. 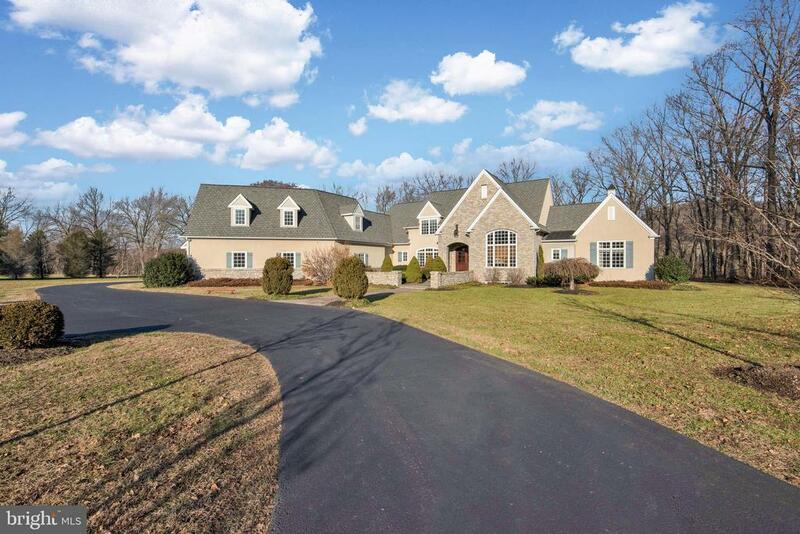 Impressive gates open to a long drive that delivers you to this cut stone sprawling home. The main foyer looks out on a custom pergola through walls of glass. The house is divided between the public spaces to the left and the master suite on the right. The expansive master offers an oversized bedroom area, office space and spa-like master bath. The very large and light filled kitchen captures the true essence of the home with vistas in all directions. The Great Room with fireplace is contiguous with the kitchen and dining area that creates an architectural space that is both aesthetically pleasing and visually sumptuous. The second level contains two family or guest bedrooms with private baths, walk-in closets and a washer and dryer. Conveniently close to the kitchen is a complete apartment with separate entrance is perfect for in-laws or an Au Pair. A large separate space perfect office area, gym area or other potential uses can also be accessed from the main house or separate side entrance. This retreat style home provides all of the entertainment one needs...both an in-ground pool, pool house, koi pond and a professional tennis court with nighttime lighting. Hyperion Hall, built by distinguished contractor Ferman Lex, is a home that provides both quality construction and the natural landscape that would be difficult to find again. If you are looking for the antithesis of a mass built Mac Mansion, then Hyperion Hall is a home that reflects the grandeur and sensibility of those iconoclastic dwellings of yesteryear. The generator covers 100 percent of the house." "A private elevator opens to a world of fine finishes and stunning Delaware River views at this almost 4,000-square-foot Waterview Place residence. Step into the entry foyer to get your first taste of the carefully chosen custom elements that shine throughout this floor-through home. Laser-cut, double-leaf, arched entry gates created by a Palm Beach foundry artfully divide the foyer from the main living area. The foyer flooring is timeless Italian limestone and hand-finished, custom-made door hinges and hardware trim the coat closet doors and most other doors in this residence; all is lit by soft cove lighting, an element carried through to the living and dining areas. Inside, the river views are dramatic; step outside to the full-length terrace and experience how soothing the sound of the water is. The open floor plan creates a living/dining area grand in scale. Finished in medium-toned Southern Chestnut wood flooring, these spaces are designed for entertaining. A gas fireplace with antique mantle is adjacent to a hidden wet bar with Walker Zanger mosaic tile backsplash. The dining and living rooms open to the terrace which is large enough for several seating areas as well as a grill or outdoor kitchen. Pocket doors in the dining room open to reveal a sun-filled kitchen with windows that offer both north and south river views. Perhaps the resident bald eagle will do a fly-by as you enjoy your morning coffee. Note the Biedermeier design influence in the kitchen~s custom cherry and bird~s eye maple cabinetry, all topped with Quartz countertops and above-cabinet lighting. Dacor double ovens, Dacor 5-burner gas cooktop with downdraft, Viking refrigeration and an Asko dishwasher are ready for everyday and special-occasion service. Two spacious guest bedrooms, a full hall bath finished with floor-to-ceiling Walker Zanger tile, a soaking tub and separate shower and a laundry room are situated at this end of the residence. Through the hall past the powder room and closet s"
"Extraordinary Design that integrates an open concept with sweeping views from every room. 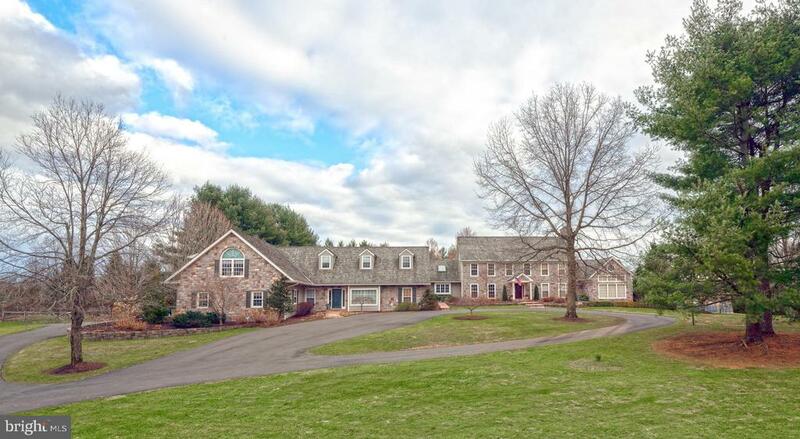 This custom built and totally renovated French Country estate is situated on a private 10 acre lot in Solebury with convenient access to downtown New Hope, Newtown and short drive to I-95. The home provides for wonderful natural light, high ceilings, beautiful Brazilian cherry floors, and exceptional room sizes that flow together. The reverse layout features the main living on the top floor with Bedroom Suites and additional living spaces below. The enormous Gathering Room offers 30 ft ceilings, wet bar, stone fireplace and doors out to an expansive terrace. The heart of the home is the Gourmet Kitchen highlighting a commercial 6 burner Viking stove, two built in Viking ovens, warming drawer, Viking refrigerator, 3 dishwashers, pot filler, additional refrigeration drawers, bar seating on the oversized island and additional dining area with custom built in seating. The Main Suite is a luxurious retreat with tray ceiling, enormous dual walk-in closets, and sumptuous Bath boasting radiant heated floor. The lower level of the home offers even more living space including a complete 2nd Kitchen with dining area that leads out to the private resort style pool and spa, Full Bath, Billiard~s Room and Gym. Enough space for everyone and perfectly laid out, this home also provides for the latest technology for cameras, alarm, and exterior lighting to be controlled on your phone. 4 car Garage with 10~ ceilings, professional work shop with Full bath and private entrance allow for a multitude of uses and offers something for everyone! A one of a kind lifestyle for the discerning buyer." "The Beaufort and its Waterfront Property is now available. The Beaufort is one building, accommodating seven individual personalized apartments on waterfront property in the historical hamlet of New Hope, Pennsylvania and offers 60 feet of views of the Delaware River. Whether purchasing The Beaufort as an investment for a steady income source or wanting it all as a private home with your own grand river-vistas or perhaps a little of both, The Beaufort is authentically prime real estate. This flexible property lends itself to literally endless amalgamations of living-space. Entrepreneurs desiring steadfast income can keep the units as they are, combine the various units in any number of ways, to include creating your own living space within the rentals, or turning the entire edifice into your own custom home on the river. The apartments include: 1- Two Bedroom unit; 3- One Bedroom units; and 3- Studios units, all of which are currently occupied. This property is located approximately 45 minutes to Philadelphia, 1.5 hours to NYC, 30 mins to Princeton with Trans Bridge Bus services in town and various train services nearby. New Hope/Solebury boasts its renowned school district, low taxes, preserved lands, state parks, natural resources, lots of live entertainment including both local/equity talents, fabulous restaurants and friendly people, which adds further value to The Beaufort and its prime real-estate title." 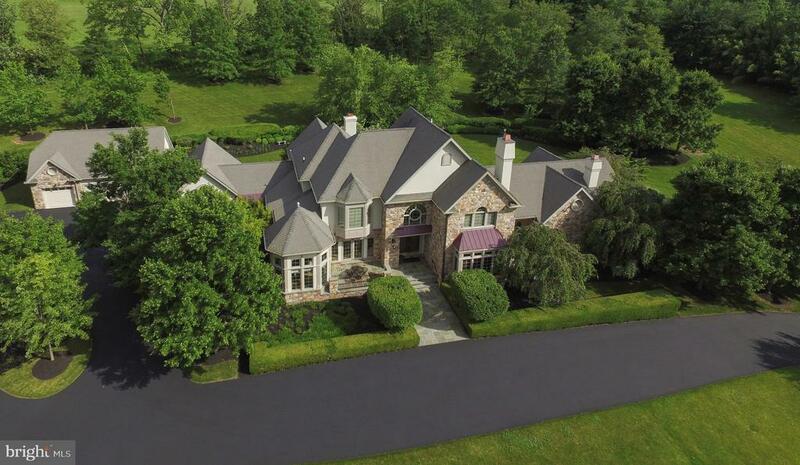 "Bramingham Estate, Like no other property in the New Hope-Solebury area. Once you pass through the gated entrance, you follow the meandering driveway to one of the most private compounds in Bucks County. An Old World feel immediately takes a grip as you approach the beautiful, stately stone main residence. Upon entering the home, it's interior takes you back to a more civilized and sophisticated time, with 10 foot ceilings, marble, warm wood paneling, beautiful hardwood floors and extensive millwork all done with superb attention to detail. Adjacent to the main residence is the Lodge. A 4 bedroom, 4 bath guest house re-purposed from a 200+ year old stone barn with exposed beams, huge stone fireplace and large windows overlooking the gardens.. There is a 3-car oversized garage with a finished 2nd level allowing for storage or the space could be re-imagined. An outdoor entertainment complex includes a huge free form pool with multilevel stone terraces and a large covered 40 person gazebo which overlooks the pool. There is a pool house with full kitchen, his and hers changing rooms/bathrooms and the second floor offers a full one bedroom apartment. A tennis court lit for night play, a pond, formal gardens, rolling lawns, mature planting and beautiful stone work throughout the property create a spectacular oasis. This exceptionally private escape is just minutes to all New Hope has to offer, 70 minutes to NYC, 50 minutes to Philadelphia and 30 minutes to Princeton. This is truly a one of a kind property!" "~Serenity~ is a magnificent Estate custom built by Deluca and is situated on over 10 bucolic, gorgeous acres on Pidcock Creek. This stately and sophisticated Home offers luxury, privacy and wonderful amenities at every turn. 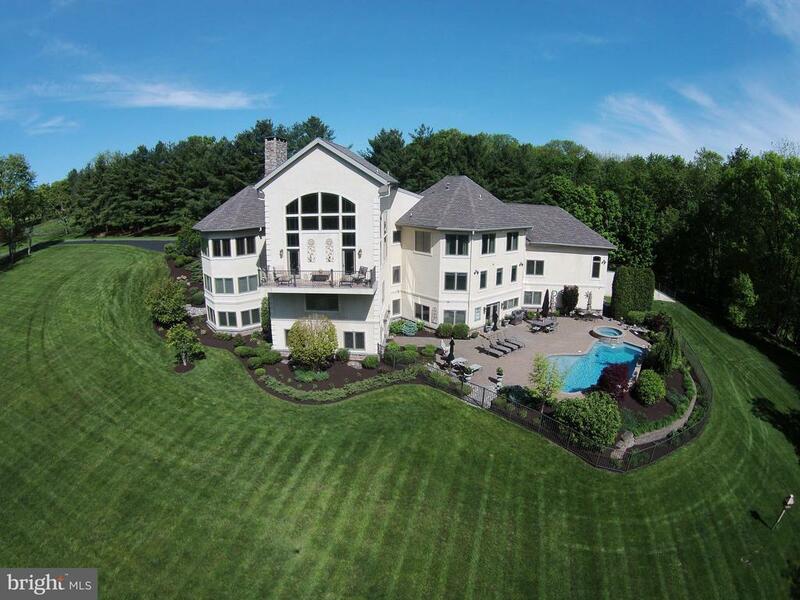 A long, private drive over a meandering stream leads to this stone front masterpiece. Enter into the grand foyer with marble floor, a wall of windows and an elegant turned staircase. To the left is the bright formal Dining Room with hardwood floors, tray ceiling with double crown molding, columns, walls of windows and a door to the front blue stone patio. Step down into the Conservatory with 3 walls of windows and beautiful views from all angles. The Gourmet Kitchen has the best of everything; granite counters, island and backsplash, custom cabinetry, commercial gas range, wet bar, wine fridge and a large Breakfast Room. It is open to the Gathering Room with soaring beamed ceiling and a stone double sided fireplace. There is a 1st Floor Master Suite that is truly a retreat. A private entry foyer opens to the Bedroom with vaulted coffered ceiling, extremely spacious walk-in closet with built-ins, a double sided gas fireplace that can be enjoyed in the sitting room which is open to the sumptuous Bath with Jacuzzi tub, extended rounded shower, 2 vanities and a sauna. Upstairs is a Bedroom suite with private Bath and 2 Additional Bedrooms that share a Bath. Other highlights: 1st floor additional family room, Billiards Room/Office with fireplace and built-ins, water conditioner and softener, a backyard oasis with custom gazebo, lighting, bluestone patio and extensive professional landscaping. All of this along with a truly magnificent setting on one of Solebury's most beautiful country roads~"
"A true masterpiece! One of #BucksCounty's finest barn conversions ever seen! Its architectural beauty combined with the highest level of interior amenities and state of the art construction, has created a perfect barn structure. Located in prestigious #UpperMakefield in award winning #CouncilRock school district, this green home features a state of the art Geothermal heating and cooling system, trees from the property's building envelope were milled on-site into impressive wide-planked flooring that were naturally dried and used throughout the home. Upon entering, you are wowed by the soaring ceilings and impressive staircase along with the soaring ceilings, exposed beams and stunning stone fireplace. The kitchen is a chef's dream with all commercial grade top-of-the-line appliances, custom wood cabinetry, and magnificent soapstone countertops... the extra wide sink is also made of the natural soap stone. The first floor master suite is a true retreat with two story ceilings, walk-in closet, and an sumptious full bath with two story shower featuring stone walls, double sink, water closet and an incredible copper soaking tub!! The upstairs which overlooks the great room, features three other bedrooms and hall bath (two of which have their own private baths!) and another room which can easily become a 5th bedroom. The main living area also has a wall of glass doors that seamlessly fold into the wall creating an exquisite space for entertaining... truly brining the outside in! Natural, Green and energy efficient products & systems were carefully chosen to finish this flawless construction which was completed by the award winning Bucks County construction company, Wothington-Shagen! 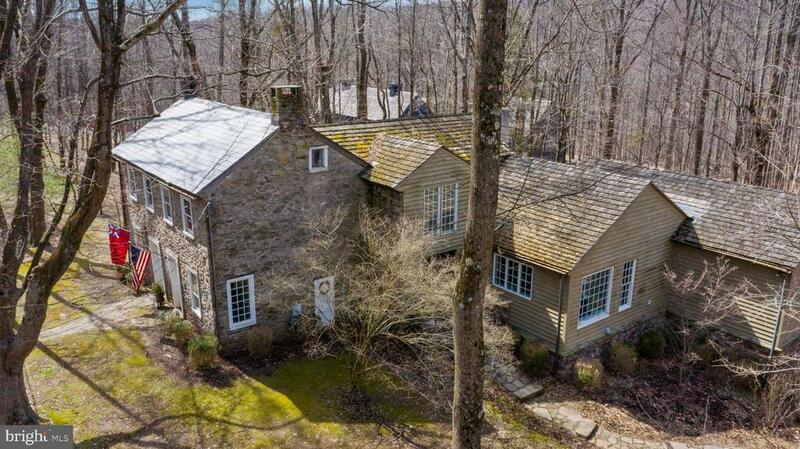 This true estate property also features a log cabin/guest house with fireplace, exposed stone and natural timbers with a lovely bath.... A true, MUST SEE!" "Travel down the winding drive to this beautifully presented, elegant home which sits on a rise giving way to spectacular protected views. The fabulous floor plan on four levels of finished space includes a soaring two story living room and breakfast room and an open kitchen and family room with fireplace inglenook as well as a spacious office and a beautiful library. In the inviting lower level you'll find a wonderful movie theater, wet bar and a wine cellar with tasting room. The master suite offers a warm fireplace, soaring ceiling and a luxury bath situated to soak in the views! Keep fit or play billiards in the top floor game room and exercise room. A private drive leads to the large, separate in-law/guest suite. Designed for entertaining with a gorgeous bluestone patio that stretches across the back of the house offering breathtaking immediate and long distance views of the countryside. All this is wrapped up in creative and colorful gardens, sweeping lawns and stately trees." "Wynfield Hall is an exceptional example of old world craftsmanship and details not found in comparably priced homes today. This Zaveta masterpiece was built with the concept of green construction and sophistication as a fusion of the best of both worlds. Sited on 3.8 Solebury acres, Wynfield Hall is over 7,000 square feet of luxurious living space that offers 4 bedrooms and 4.2 baths. The nucleus of the home is the Artisan crafted staircase that leads to the rotunda and sleeping quarters. The infrastructure is concrete and steel wrapped in the finest of millwork and designer finishes. The walnut library is the perfect respite to find solitude, and yet, just a few feet from the family quarters. The well equipped kitchen was designed for a master chef and the caterer's prep area contains a commercial grade walk in refrigerator for the ultimate entertaining. The owners specified 5 zones and 23 thermostat controls so that the precise energy efficient heat and central air can be evenly distributed. This is a home that needs to experienced...the upgrades and unique features are too numerous. The rear yard is ideal for al fresco dining while listening to the cascading wall of fountains. Wynfield Hall not only offers the design aesthetic of a discerning buyer, but the coveted classicism of a bygone era." "Welcome to the magnificent estate, Idlewild South, situated on 14.5 acres of beautifully manicured lawn and gardens within minutes of New Hope Boro, Washington Crossing and Peddler~s Village. Enter thru an impressive gated entry and take in the beauty and privacy of this gorgeous lot with long distance views and pond. A custom built Georgian colonial, this home has been meticulously cared for by the original owners with every detail carefully considered. A large, open concept foyer with marble flooring and vaulted ceilings reveals the gorgeous custom millwork found throughout. The Formal Living Room has lovely hardwood floors, wood burning fireplace with marble mantle, a coffered ceiling and entry to a private Study. The Formal Dining Room features an ornate tray ceiling along with custom millwork and a wood burning fireplace with a marble mantle. The Family Room contains a large stone mantle wood burning fireplace, dentil molding and French Doors leading to the professionally landscaped patio. A bonus room can be utilized as a first-floor bedroom. A 6 burner Viking Range, custom cherry cabinetry, oversized granite island, and a Subzero fridge are found in the Gourmet Kitchen. Accompanying the kitchen is a Morning Room with dentil molding, exposed brick to match the exterior and large windows allowing you to gaze out to front lawn. A laundry room, half bath, 2 pantries are the additional amenities found on the first level. The Master Suite features recessed lighting, wainscoting and an entry out to a wonderful sitting area overlooking the spectacular landscape and pond on the property. The Master Suite contains marble flooring and counters on the double vanity, dentil molding and separated jacuzzi tub and shower. 3 additional bedrooms are located on the second level with one shared full bath and one private full bath. A lovely bluestone patio leads to the landscaped pool and pool house and a covered walkway to the detached 3-car garage. Additional benefits include"
"THE RAYMOND EMERSON HOUSE 6405 Old Carversville Rd, Solebury. Rarely does a property come on the market that truly possesses exceptional design, quality craftsmanship, history, location and scenic beauty. This 18th Century Bucks County stone house was completely restored in 2005 and expanded to include a 3,000 sf wing that combines today~s inspired architectural elegance and modern amenities, pairing it perfectly with the historic structure and coziness of the original antique home.Mahogany double entry doors open to a two-story entryway leading to a stunning, sunlit open floor plan with great room, designer kitchen, cozy, intimate breakfast nook, laundry area, and powder room. The entire space is surrounded by tall casement windows, filling the rooms with natural light, while offering breathtaking views of the gently sloping wooded landscape and Paunnacussing Creek. French doors lead to a deck area, perfect for outdoor dining and relaxation. The main floor is also home to a beautiful and serene master suite with cathedral ceiling, fireplace, dual walk-in closets , elegant bath with 3-head shower, double sinks and heated towel bar. French doors from the master bedroom open to a private deck with hot tub.Walk directly into the original stone home from the main floor living area, and enter a 20x30 living room with fireplace, hand-hewn ceiling beams and cypress hardwood floors. This wing of the house has two bedrooms and a full bath upstairs, as well as a charming lower level with stone fireplace, sitting room and kitchen. Cross the threshold from the lower level back into the new wing, where you~ll find a large and inviting media room with stone fireplace and doors opening to a slate patio. This lower level also includes a full bath, bedroom, workshop and garage access.Expert craftsmanship is evident throughout the home. The discerning buyer will find much to admire, from finely detailed millwork, cypress and pumpkin-pine hardwood floors, ambient lighting, stone fi"